Jody Danielson B.Sc. KPACTP grew up in Vancouver and discovered clicker training while trying to teach her childhood dogs Sam (an independent northern breed mix) and Zoe (a feisty terrier) to open the fridge, turn on the tv and mostly, come back when called. She was soon training her cat, hamsters, sister and parents. Jody has always had a passion for animal behaviour; her idols were James Herriot and Konrad Lorenz. With that interest at heart, Jody otained her Bachelor of Science in Animal Biology from UBC in 2008. She concentrated her studies on animal behaviour, psychology, and animal welfare courses; she finished her five years with an undergraduate thesis project involving trained mice with the animal welfare department. On weekends and during co-op work terms, Jody worked as a veterinary assistant with a busy small animal practice, at the UBC animal care centre and as a research assistant for Agriculture and Agri-food Canada. 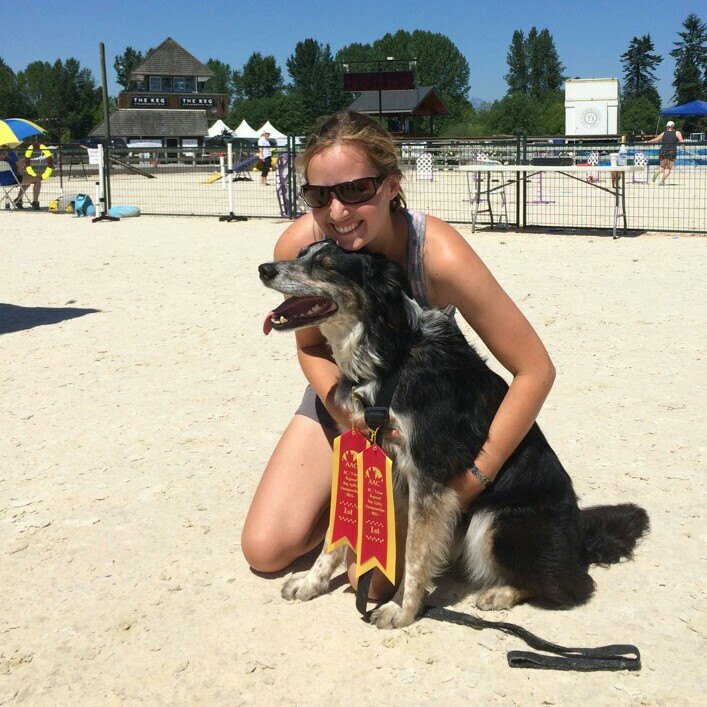 Because working towards her degree wasn't enough of a time commitment, she also fostered dogs for Border Collie Rescue and adopted reactive, wonderful muttly-dog Abby and BC puppy Ryan. She then took up agility, flyball, herding and Rally-O. After graduating, she worked for four years as a research technician at the Vancouver Aquarium with the trained Steller sea lions and fur seals. It was there that the art and science of training really came together for her as she worked with species that absolutely can't be physically forced or intimidated. Jody now owns a hobby farm in Glenora with her fiancé, Nathan, and their 30 chickens, 7 ducks, 4 sheep and 1 goat. Abby and Ryan are retired from their competitive agility careers, the highlights of which were earning Abby's Agility Trial Champion of Canada and placing 3rd with Ryan at the 2013 AAC Regionals. Jody's current agility dog is Zoey, a border collie cross who was found in an abandoned Buick as a puppy. If you're looking for a dog walker or a pet sitter, Jody also runs Colliewood Pet Care (www.colliewoodpetcare.com).